This is not your ordinary how-to book! Austin TX based authors and polymer clay artists Kim Schlinke and Randee M. Ketzel artfully mix a clever mystery with 20 how-to projects that show step-by step photographs and instructions to create your own “ancient artifacts.” These polymer clay masterpieces are beautiful enough to grace a museum collection—or yours! At 206 pages, this lavishly photographed book is stuffed with a multitude of projects that can be done just as presented with highly detailed step-by-step instruction, or used as starting points to make faux gems for use in all sorts of designs. Priced retail at $30, this hefty tome’s many how-to projects weigh in at the mere cost of $1.50 each. Many online tutorials are priced higher, without the added bonus of a story and a beautiful book. 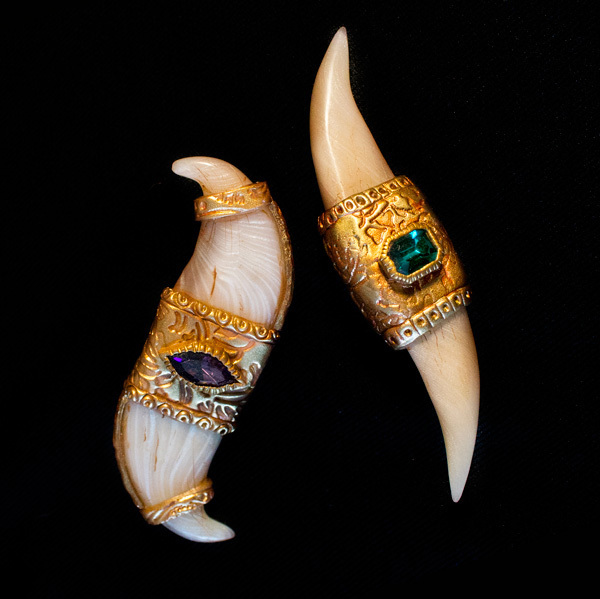 Animal lovers will be pleased to note that our authors also give us the secrets of making replicas of ivory and tiger claw that involve no cruelty towards elephants or wild cats whatsoever. Find out how it is all done—and “who done it”—along with our intrepid protagonists, Parker and Peele. “What is this stuff?” wondered Parker, and her companion pointed her umbrella to the drawings that plastered the walls. “The raw materials for the best forgeries ever seen” replied her friend. “This is where they were created.” Together they examined the drawings, exclaiming softly as they recognized several objects from the Museum.